Negotiable Instruments Act, 1881 - Section 131 - Non-liability of banker receiving payment of cheque. Section 131 of the Act applies when the true owner of the crossed cheque initiates proceedings against the collecting bank that had received payment on behalf of their customer/client. This customer/client would be a third person and not the true owner who has sued the collecting bank. The collecting bank that has credited or made payment to the customer/client can defend the proceedings initiated against them by the true owner by showing that they had acted in good faith and were not negligent when they had credited and made payment to their customer/client. Strictly, Section 131 of the Act applies when the collecting bank is sued by the true owner and not when the collecting bank sues its customer/client to recover the amount paid. Section 131 of the Act is a protection and shield meant for the collecting bank that had received and had made payment. Since the collecting bank acts as an agent of its customers/clients, it is not expected to take direct responsibility for the cheque crossed, generally or specially, to the true owner when it acts in good faith and without negligence. In such cases the collecting bank is not liable to the true owner by reason of only having received payment. 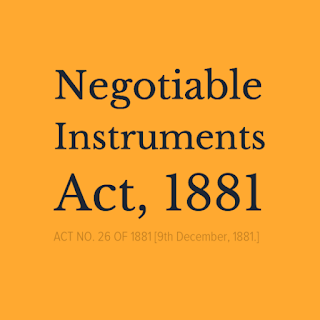 Negotiable Instruments Act, 1881 - Section 131 - Non-liability of banker receiving payment of cheque - A collecting bank, in order to avail of the statutory protection of Section 131 of the Act, must show and establish that it had acted in good faith and no negligence can be attributed to it at the time of "receiving" the payment. The test to determine and decide whether the bank had acted in good faith and with due diligence, depends upon general practice of the banks. In some cases it could extend to opening of accounts in which the cheque was deposited. However, the bank is not required to subject the cheque to minute and microscopic examination. On the face of it, the instrument should give rise to suspicion. 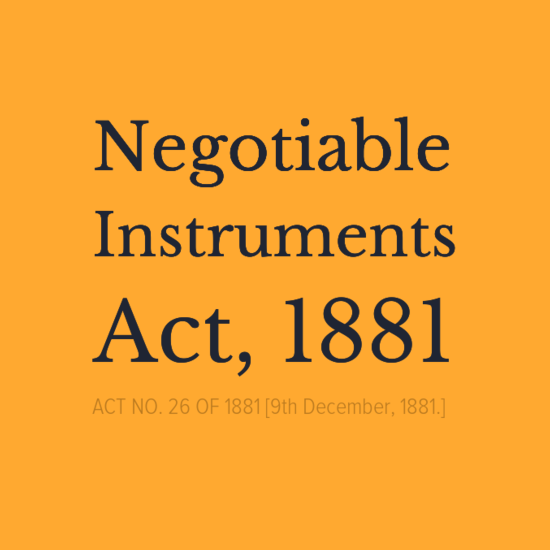 Negotiable Instruments Act, 1881 - Section 131 - Non-liability of banker receiving payment of cheque - Test of negligence for the purpose of Section 131 of the Act is whether the transaction of paying in any given cheque, coupled with the circumstances antecedent and present is so out of the ordinary circumstances, that it ought to arouse doubts in the bankers' mind and cause him to make enquiries. 6. Subsequently, on 25.08.2009, the petitioners were served with the legal notice issued on behalf of the respondent-bank to remit/refund Rs.31,45,696/- as they had been intimated by their Foreign Department that the corresponding/collecting bank in USA vide letter dated 05.08.2009 had informed that the cheque was "Altered Cheque". Accordingly, payment of Rs.31,45,696/- was reversed. Petitioners had contested the notice stating and highlighting the above facts and also asserted that Foreign Inward Remittance Certificate (“FIRC”) had been issued on 27.02.2009 by the respondent-bank. 7. On 31.10.2009, a criminal complaint was lodged by the respondent-bank against the petitioners with the Economic Offence Wing, New Delhi stating that the aforesaid cheque was returned as "Altered Cheque" and that earlier another cheque had been returned being a "Counterfeit Cheque". 8. On 31.12.2009, the respondent-bank filed Original Application No.08/2010 before the Debt Recovery Tribunal-III, Delhi („Tribunal‟ in short) for recovery of Rs.31,95,860/- with pendente lite and future interest against the petitioners. Original Application was allowed vide the order dated 10.05.2013 by the Tribunal directing the petitioners to pay Rs.31,45,696/- to the respondent-bank within a period of 30 days with simple interest @ 14% p.a. from the date of filing of the Original Application till its realization. 20. In the present case, payment was made and credited to the account of the petitioners. The petitioners are not aggrieved by the credit and payment made. They accepted and admitted that the credit was to the petitioner's benefit. They are defending the recovery proceedings initiated by their bank. Further, as elucidated below the cheque in question was an altered one and the name of the holder as well as the amount was changed and altered as payable to the petitioners. Clearly the petitioners were not the true owners. 21. Assuming that Section 131 of the Act applies, we would examine the expressions "good faith" and "without negligence" and consider whether the respondent-bank was liable and cannot recover the money paid to the petitioners under the forged cheque presented to them for payment by the petitioners. The said elucidation would be also relevant when we consider the contention of the petitioners that even if Section 131 of the Act was not applicable, the petitioners were entitled to defend the proceedings for recovery initiated by the respondent-bank on the ground of negligence and lack of due diligence on the part of the respondent-bank. "73. The section therefore makes it clear that when a banker receives from its customer a cheque crossed in its favour for collection and received payment of the amount in its customer's behalf, the fact that the customer's title to the cheque is defective does not render the banker liable to the true owner, (see „Morison v. London County and Westminster Bank Ltd.‟, (1914) 3 KB 356 (R). 74. But the section affords protection to the banker if the banker has received payment in good faith and without negligence, otherwise the bank which receives payment on a forged cheque or a cheque to which the customer has no title or only defective title is liable in action for conversion to the true owner, „Matheissen v. London & County Bank‟, (1879) 5 C.P.D. 7 (S), See also Paget-Banking, 5th Edn. (1947) - pages 229-2301 and cases to footnote (g), at page 230). See also (1924) 1 K.B. 775 (D)." “23. In Capital and Counties Bank v. Gordon 1903 AC 240, the House of Lords accepted the position that a bank acts basically as a mere agent or conduit pipe to receive payment of the cheques from the banker on whom they are drawn and to hold the proceeds at the disposal of its customer. Unless crossed the banker himself is the holder for value. He may be a sum collecting agent or he may take as holder for value or as holder in due course. As an agent of the customer for collection he is bound to exercise diligence in the presentation of the cheques for payment within reasonable time. If a banker fails to present a cheque within a reasonable time after it reaches him, he is liable to his customer for loss arising from the delay. A banker receiving instruments paid in for collection and credit to a customer's account may collect solely for a customer or for himself or both. Where he collects for the customer he will be liable in conversion if the customer has no title. However, if he collects in good faith and without negligence he may plead statutory protection under Section 131 of the Act. …. (2) The banker, however, may claim protection from such normal liability provided he fulfils strictly the conditions laid down in Section131or Section 131A of the Act and one of those conditions is that he must have received the payment in good faith and without negligence. (3) It is the banker seeking protection who has on his shoulders the onus of proving that he acted in good faith and without negligence. (4) The standard of care to be exercised by the collecting banker to escape the charge of negligence depends upon the general practice of bankers which may go on changing from time to time with the enormous spread of banking activities and cases decided a few decades ago may not probably offer an unfailing guidance in determining the question about negligence today. (5) Negligence is a question of fact and what is relevant in determining the liability of a collecting banker is not his negligence in opening the account of the customer but negligence in the collection of the relevant cheque unless, of course, the opening of the account and depositing of the cheque in question therein from part and parcel of one scheme as where the account is opened with the cheque in question or deposited therein so soon after the opening of the account as to lead to an inference that the depositing the cheque and opening the account are interconnected moves in a integrated plan. (6) Negligence in opening the account such as failure to fulfill the procedure for opening an account which is prescribed by the bank itself or opening an account of an unknown person or non-existing person or with dubious introduction may lead to a cogent, though not conclusive, proof of negligence particularly if the cheque in question has been deposited in the account soon after the opening thereof. (7) The standard of care expected from a banker in collecting the cheque does not require him to subject the cheque to a minute and microscopic examination but disregarding the circumstances about the cheque which on the face of it give rise to a suspicion may amount to negligence on the part of the collecting banker. (8) The question of good faith and negligence is to be judged from the stand point of the true owner towards whom the banker owes no contractual duty but the statutory duty which is created by this section and it is a price which the banker pays for seeking protection, under the statute, from the otherwise larger liability he would be exposed to under common law. (9) Allegation of contributory negligence against the paying banker could provide no defence for a collecting banker who has not collected the amount in good faith and without negligence." 27. Thus, a collecting bank, in order to avail of the statutory protection of Section 131 of the Act, must show and establish that it had acted in good faith and no negligence can be attributed to it at the time of "receiving" the payment. The test to determine and decide whether the bank had acted in good faith and with due diligence, depends upon general practice of the banks. In some cases it could extend to opening of accounts in which the cheque was deposited. However, the bank is not required to subject the cheque to minute and microscopic examination. On the face of it, the instrument should give rise to suspicion. Lastly, contributory negligence it has been observed is of no consequence. "37. ..that expansion of the banker's liability and corresponding narrowing down of the banker's protection under the provision of Section 131 of the Act may make the banker's position so vulnerable as to be disadvantageous to the expansion of banking business under the ever expanding banking system. This is because a commercial bank, as distinguished from a Central bank, has the following characteristics, namely (a) that they accept money from, and collect cheques for, their customers and place them to their credit; (2) that they honour cheques or orders drawn on them by their customers when presented for payment and debit their customers accordingly; and (3) that they keep current account in their books in which the credits and debits are entered. The receipt of money by banker from or on account of his customer constitute it the debtor of the customer. The bank borrows the money and undertakes to repay it or any part of it at the branch of the bank where the account is kept during banking hours and upon payment being demanded. The banker has to discharge this obligation and normally the banker would not question the customer's title to the money paid in. Applying the above principles of law to the facts of the instant case we are not inclined to hold that the Bank was negligent either in collecting the cheques and drafts or allowing Sethuraman to withdraw the proceeds." 29. In London Joint Stock Bank, Limited v. Macmillan & Arthur,  A.C. 777, it was held by the House of Lords that if the customer chooses to dispense with ordinary precautions because he has complete faith in his clerk's honesty, he cannot claim to throw upon the banker the loss which results. No one can be certain of preventing forgery, but it is a simple thing to take reasonable and ordinary precautions while drawing a cheque against forgery. If owing to the neglect of such precautions a dishonest person indulges in forgery, the customer must bear the loss as between himself and the banker. The banker is bound to make inquiries when there is anything to arouse suspicion that the cheque is being wrongly dealt with while being paid into the customer‟s account. The banker, however, is not called upon to be “abnormally suspicious” as was held in Penmount Estates Limited v. National Provincial Bank Limited; Stanley Moss & Pilcher (Third Party) 5 LDAB 418. 31. Test of negligence for the purpose of Section 131 of the Act is whether the transaction of paying in any given cheque, coupled with the circumstances antecedent and present is so out of the ordinary circumstances, that it ought to arouse doubts in the bankers' mind and cause him to make enquiries. We are unable to find any material to demonstrate lack of good faith or failure to exercise due diligence or ordinary care when the cheque was presented for collection. Impugned order reveals that the drawer of the cheque had earlier tampered a cheque, which fact was known to the petitioners. The petitioners were aware given the past conduct that there was a probability that the cheque in question could be tampered. They should have been more vigilant and should have exercised care before exporting rice. This was the risk taken by the petitioners. The respondent-bank could not have entertained any doubts as to the genuineness of the cheque at the time of receiving the cheque from the petitioners or for making it over to the drawee bank for collection. The tampering could not have been deduced by the respondent-bank. The petitioners had presented the instrument as the true owners. "I think that where money is paid to another under the influence of a mistake, that is, upon the supposition that a specific fact is true, which would entitle the other to the money, but which fact is untrue, and the money would not have been paid if it had been known to the payer that the fact was untrue, an action will lie to recover it back, and it is against conscience to retain it; though a demand may be necessary in those cases in which the party receiving may have been ignorant of the mistake. The position that a person so paying is precluded from recovering by laches, in not availing himself of the means of knowledge in his power, seems, from the cases cited, to have been founded on the dictum of Mr. Justice Bayley, in the case of Milnes v. Duncan and with all respect to that authority. I do not think it can be sustained in point of law. If, indeed, the money is intentionally paid, without reference to the truth or falsehood of the fact, the plaintiff meaning, to waive all Inquiry into it, and that the person receiving shall have the money at all events, whether the fact be true or false, the latter is certainly entitled to retain it; but if it is paid under the impression of the truth of a fact which is untrue, it may, generally speaking, be recovered back, however careless the party paying may have been, in omitting to use due diligence to inquire into the fact. In such a case the receiver was not entitled to it, nor intended to have it." 33. In Imperial Bank of Canada v. Bank of Hamilton, 1903 AC 49, the Privy Council has followed the rule laid down in Kelly's case (supra). In this case, cheque for a certain amount certified by the bank's stamp was fraudulently altered to a bigger amount and paid by the respondent to the appellant, a holder for value under a mistake of fact, which was not discovered till the next day. Privy Council held that the respondent was entitled to recover from the appellant-bank. Thus the rule laid down in Kelly's case (supra) is that if a person acting under a mistake pays money to another, the latter must repay the same. 35. To decide the controversy, the following facts have to be noticed. Cheque bearing No.375380 for US$ 62,400 drawn on Bank of America was sent by the respondent bank for collection through their Foreign Department. The cheque was thereafter sent to the United State of America and presented for encashment through J.P. Morgan Chase Bank. Thereafter, funds were received by the Foreign Department in US value on 17.11.2008. In these circumstances, after the waiting period was over, the respondent bank had credited proceeds of Rs.31,45,696/- in the current account of the petitioner on 8.12.2008. Subsequently, on 21.1.2009, Bank of America had written and forwarded their claim to J.P. Morgan Chase stating that the cheque in question was an altered one. Firstly, the name of the original payee Genaro G. Mautinez had been altered to Adya Global Export Inc. i.e. the petitioner No.1. Secondly, the original amount of US$ 59.29 had been altered to US$ 62,400. The Bank of America had enclosed letter of Jaques Admiralty Law Firm regarding cheque fraud claim with an affidavit regarding altered status of the cheque. The Bank of America, therefore, had issued certificate dated 21.1.2009 for adjustment/recovery to J.P. Morgan Chase Bank through whom the cheque was presented for encashment. J.P. Morgan Chase Bank had thereupon made payment of US$ 62,400 to the Bank of America as per Article 4-208 of the Uniform Commercial Code. J.P. Morgan Chase Bank had stated that they had accepted the item for deposit and presented it for payment under certain warranties, which had been breached. Thereafter, the Foreign Department had informed the respondent bank and letter dated 5.8.2009 was issued for remission of Rs.31,45,696/-.